Lightweight smooth finish card stock Snowflake frames hold Polaroid 600, 667, 668 and Spectra prints. 3 panel construction folds to create easel frame. This Snowflakes Easel Frame is printed with a colorful design and has a window opening to hold a Polaroid picture in place. 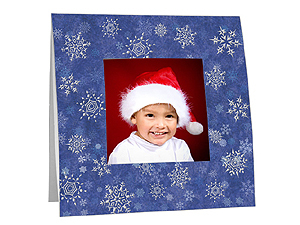 Easel frames are perfect for Winter Dances, Cruises, Visits with Santa, Holiday Parties & more. Send your party goers home with a unique souvenir photo keepsake that makes the perfect party favor for your event. The festive holiday graphic make these frames suitable for immediate use and can also be personalized in foil with your logo or custom message to add impact to your Christmas or holiday event!